Pizza Hut is an American restaurant chain with international franchises. They offer a variety of pizzas and sides, as well as pasta, salads, and desserts. Pizza Hut restaurants are usually family-style, with a recent American-themed redesign. Some Pizza Hut restaurants are Dine-In only, while some offer delivery and collection as well. There are also separate takeaway stores you can order from for delivery and collection only. Delivery is free when you meet the minimum value to place an order. This amount will vary according to the restaurant or storefront. Some Pizza Huts may not deliver to your postcode, but you may still be able to place an order for collection and go to pick it up. When you order from Pizza Hut online, they will send a confirmation e-mail. This will include all the order details, including the order number and an Estimated Time of Arrival. This time will reflect how busy the store is and how long it will take the delivery driver to reach your address. You should allow at least 10 minutes after the ETA before contacting Pizza Hut about your order, if they haven’t already contacted you to let you know about a problem. The phone number for the store you ordered from will be in the e-mail. Call this number to speak to the store and find out what is going on with your order. If you cannot get through or they aren’t helping you, call Pizza Hut customer services on 0843 557 3606. They are open from 10am to 10pm every day and should be able to resolve your issue. 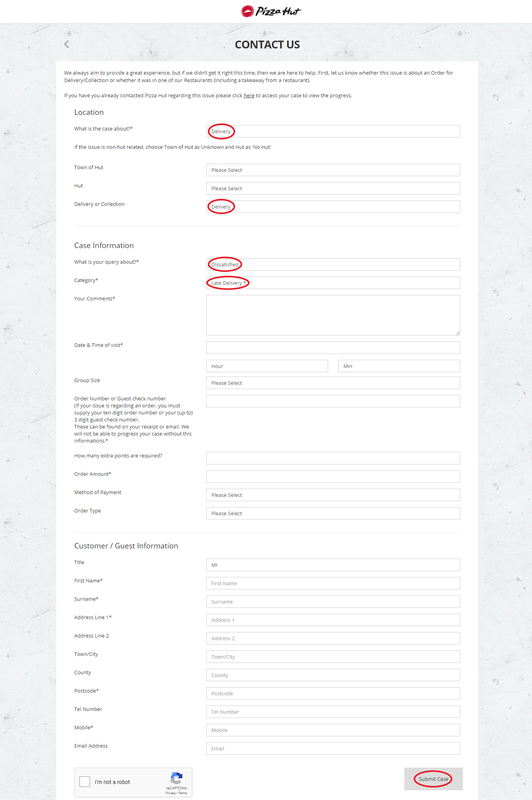 When you report the non-delivery, you must provide your order details which you can find in your confirmation e-mail. This includes the branch name and your order number, e-mail address, and delivery address. You can also contact them if you place an order for collection but when you get there the store is closed or they don’t have your order. You need to contact customer services to get a refund if you already paid online. You should also complain about the situation, since late collection can be as inconvenient as late delivery. If you order for home delivery and the store doesn’t answer about where your pizza is, call to cancel and request a refund. It can take several days for them to process a refund from an online payment. You can call back to complain again if your refund is late as well. 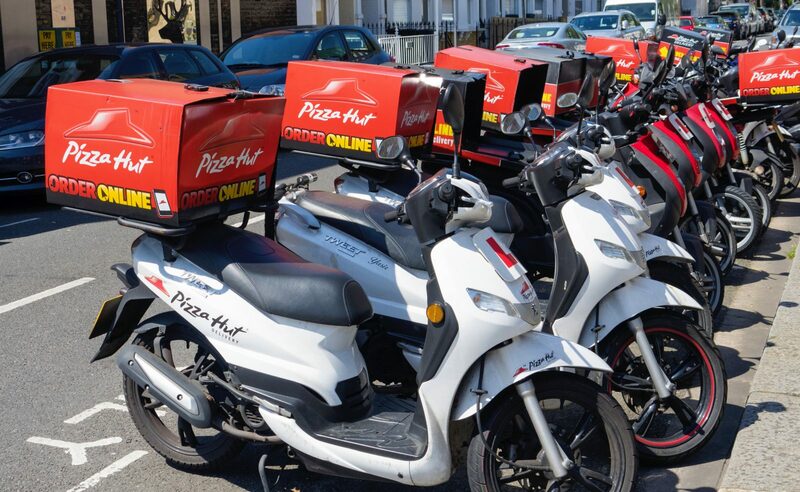 Similar to the old offer by Domino’s, in the UK there is now a Delivery Speed Guarantee for online orders from Pizza Hut. This guarantee states that if your delivery is more than 10 minutes later than their 30-minute aim, they will give you a £10 voucher. However, their terms and conditions for the guarantee are not so straightforward. If you opt for delivery ASAP, you are agreeing to the current fastest possible delivery time. This means that the ETA in your e-mail might state a time longer than 30 minutes, but you cannot use this to claim against the Speed Guarantee. Pizza Hut will start a timer from confirmation of your order to when the delivery driver hands it to you at your door. If the timer hits 40 minutes, they should automatically e-mail a £10 voucher within 7 days. Or contact them to make your claim. Some situations obviously breach your agreement with Pizza Hut as a customer. For example, if your delivery takes over an hour when your ETA was 30-45 minutes, or if you call after this time and they haven’t even started making your order yet. If you decide not to cancel and continue to wait for the delivery anyway, you should still be able to claim compensation. This could be a voucher under the guarantee. Or for more extreme cases of poor customer service, Pizza Hut may issue gift cards as a goodwill gesture. You will need to get in touch and complain, either by phone or online. If you do get a voucher from the guarantee, you can only use it for online orders. It will be valid for two weeks from its date of issue and only applicable for orders containing at least one pizza and no other offers. To complain to Pizza Hut about late delivery, you can go online. Tweet to @pizzahutdeliver to get support from the UK Pizza Hut Delivery team. You can complain if you have already gotten a voucher or gift card but you are having problems trying to use it. Or complain if you were promised compensation or a refund but you have not received it yet. To make a formal complaint, you will need to submit an online contact form. Select “Delivery” as the reason for creating a case and enter the store details. You should then select “Dissatisfied” and “Late Delivery” for the query categories in the Case Information section. You must also provide your order number, the total cost, your payment method, and ordering method. This is in addition to your name, home address, e-mail address, and phone number. When you submit the case, you should receive a confirmation e-mail. This will give you a Case ID number which you will need whenever you contact Pizza Hut about this complaint. You must make all late delivery complaints within 10 working days of the order date if you expect further action from them. It could take the Pizza Hut team up to 7 days to investigate and respond to your case. They will invite you to register to access your Pizza Hut Dashboard. This is where you will see messages from Pizza Hut and updates about your case. Pizza Hut might give you a list of questions about your issue which you will have 48 hours to answer. Submit another case if they fail to respond.